A bike ride is a wonderful thing. But for folks with limited mobility, it’s difficult to experience the fresh air, sun and joy that a ride can deliver. We, a group of Raleigh citizens, would like to bring the biking experience to people that may not have thought that a bike ride was even possible for them. By using specially-made tandem bicycles, we plan to offer bike rides on Raleigh’s incredible greenways. The bike that makes this all possible is the Duet Wheelchair Bicycle Tandem. 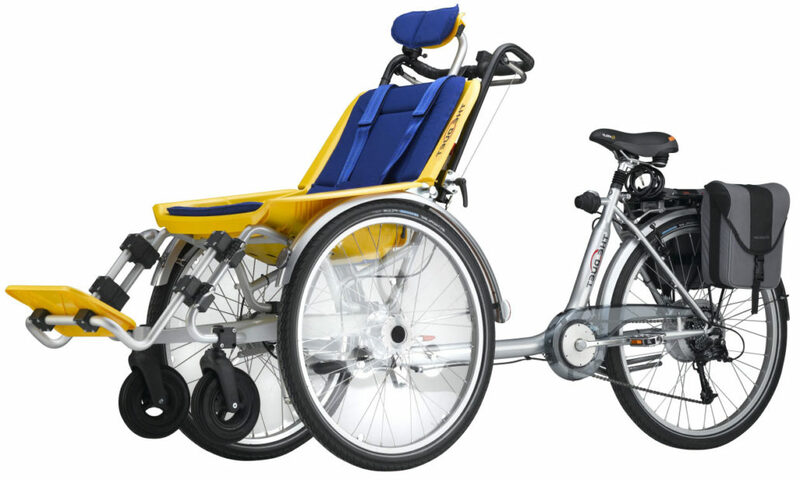 The Duet combines a bicycle with an advanced wheelchair design. Focusing on comfort and safety, the Duet can be adjusted to fit kids and adults alike. An electric-assist motor allows anyone to pilot the Duet, regardless of strength. Read the whole story on WRAL.com. There are a few areas in which we need your help. The biggest need is volunteers: people that will come out and pedal for a passenger. If that’s you, let us know! Our goal is to start with two bikes, so you’d always have a partner to work with. We’d like to establish dependable “office hours” and build a stable of volunteers that agree to ride at scheduled times. The other need is help with funding. Our goal is to raise $25k to ensure that the program will start out sustainable. If you know of a group or company that may contribute to funding, please share our info or put us in touch. Our goal is to fund the program via grants rather than via personal donations, but if you’re interested in donating, you can do so via PayPal. All financial transactions go directly to our account with the City of Oaks Foundation and are fully tax-deductible. And lastly, tell your friends! Getting a good idea of community interest helps us move forward. If you’d like to get updates, follow us on Twitter. Before purchasing our first bike, Parks & Rec staff have asked that we have a plan for maintenance. We’re looking for one or two volunteers that can come out once or twice a month and do basic maintenance: check/adjust brake & derailleur cables, make sure the chain is oiled, that kind of stuff. Maintenance would be performed onsite during park hours at a Raleigh Parks & Rec facility (to be determined). If you’ve got the skills and are willing to volunteer, send me an email at scott@therestons.com. Help us gauge interest in bringing these bikes to Raleigh! Can we contact you by email when we have news to share? In May, of 2018, we started a crowdfunding campaign to raise the remainder of the funds needed to begin the program. Tell your friends! View our page on MightyCause. In August of 2017, we finalized an agreement with the City of Oaks Foundation so that they could act as our fiscal partner. That means that donations that we accept will be tax-deductible and that no donation will pass through a personal bank account. On September 19th of 2017, Raleigh City Council approved $10k of funding for Raleigh Riders! This funding will be enough to purchase one bike and brings us almost half-way to our initial funding goal. Who will own the bikes? After the bikes are purchased, they will be gifted to the City of Raleigh. We’ve been working with Parks and Recreation staff to be sure that the bikes will be a good fit with other outdoor opportunities offered by the City. Where will the rides take place? Our plan is to store the bikes in a Raleigh Parks and Rec location near a greenway. Greenways offer great opportunities for flat routes with no automobile interference. If I donate to Raleigh Riders, where does the money go? We’ve partnered with the City of Oaks Foundation as our financial sponsor. All money collected goes directly to our account with the Foundation. Any money raised in excess of our initial fundraising goals will stay in our Foundation account and be used to cover repairs and maintenance. Can I check-out one of the bikes to ride with my family member? When we start out, we’re planning on having the bikes go out in pairs. We’re also planning on giving each pilot a bit of practice time before taking a passenger. The wheelchair tandems handle differently than a standard tandem and it helps to have some time behind the handlebars first. So, if you wanted to pedal with a family member, we’d ask that you do a bit of training first before signing up for a ride time and that you head out with another team.